Hello, fashion world? We aren't all sample sizes! You'd be hard-pressed to find someone who's even mildly interested in fashion who doesn't know who Ashley Graham is. The supermodel has appeared on the cover of multiple magazines (including American Vogue and British Vogue), has her own lingerie collection with Addition Elle, and is an advocate for size diversity in the fashion world. And, if you know of Graham, you know she's not afraid to tell it like it is. In a new interview with New York magazine, Graham explained why she didn't attend the 2016 Met Gala, even though she was a burgeoning "It" girl. "I couldn't get a designer to dress me," she said. "You can't just show up in jeans and a T-shirt." According to Graham, she had been "on hold" (which New York mag says is basically "a prelude to an invitation") for the event, but because no one would dress her, she had to skip it. However, she notes that part of the reason she thinks designers didn't come knocking on her door was because she didn't have the right relationships with them, and there wasn't enough time to get a custom-made gown. You can't just show up in jeans and a T-shirt. But another reason why she probably couldn't find anyone to make a dress for her is because the model isn't a sample size. As New York mag notes, "To dress her requires extra work — she can't wear something lying around the showroom — and an exercise in imagination that not every designer wants to go on." The following year, Graham attended the 2017 Met Gala wearing a custom H&M gown, but she still had problems finding designers who would dress a plus-size model. 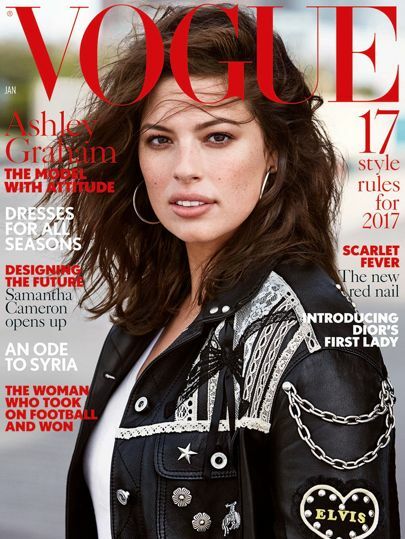 Alexandra Shulman, former British Vogue editor-in-chief, explained in her January 2017 editor's letter that, "Sadly there were other houses that flatly refused to lend us their clothes" when they found out Graham would be the mag's cover star. "It seems strange to me that while the rest of the world is desperate for fashion to embrace broader definitions of physical beauty, some of our most famous fashion brands appear to be travelling in the opposite — and, in my opinion, unwise — direction," Shulman noted. Leslie Jones can definitely empathize with Graham's predicament. Last year, the actress tweeted that no designers wanted to dress her for the "Ghostbusters" premiere. "It's so funny how there are no designers wanting to help me with a premiere dress for movie," she wrote. "Hmmm that will change and I remember everything." After many people praised the designer for stepping in, the "Project Runway" alum said he didn't need the congratulations. Although Graham notes that more designers are now willing to lend her their clothes, she recognizes that it will take more than one model to change how the fashion world sees women who are plus-size. "I'm getting a seat at the table we've never had before, and I'm also pulling up a couple of seats around me," Graham told New York. "I know this isn't about me. Just one girl is not going to change the world."